Crow Demons are encountered in the Painted World of Ariamis. 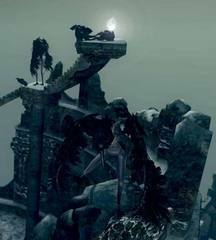 They were originally worshipers of the Goddess Velka whose bodies were warped by their devotion. Nakamura: I like to think that they were humans who wanted to fly so badly that they sprouted wings, but rather than their skeletons evolving over time, they instead twisted their limbs into unnatural positions, forcing their bodies into a birdlike shape, that’s how I’ve always imagined them. Miyazaki: I always thought of the painted world as somewhere where things go to escape, and the bird men are no different. 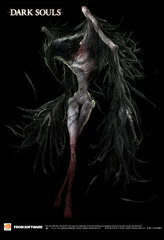 They were originally designed as worshipers of the Goddess Velka whose bodies were warped by their devotion. I think this obsession makes them really interesting characters.